This entry was posted in Faculty and tagged humanities, liberal arts on May 2, 2012 by Wire Eagle. AUBURN – Keren Gorodeisky, an assistant professor in Auburn University’s Department of Philosophy in the College of Liberal Arts, has been named a fellow of the National Humanities Center. 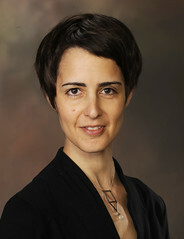 As the recipient of the Phillip Quinn Fellowship in philosophy, Gorodeisky will be in residence at the North Carolina-based center from September 2012 to May 2013, where she will work on an individual research project and have the opportunity to share ideas in seminars and lectures. “This prestigious award recognizes Keren for what she is: a rising star in the philosophy of art,” said Michael Watkins, chair of the Department of Philosophy. Gorodeisky received her bachelor of arts in philosophy and comparative literature from Tel-Aviv University and her Ph.D. in philosophy from Boston University. She has taught in Auburn’s Department of Philosophy since 2007 and serves as the adviser for the department’s Philosophy Club. The fellowship was established in 2010 to commemorate the work of philosopher Philip L. Quinn and is awarded annually in philosophy to a young woman in the early stages of her scholarly career. The National Humanities Center is a privately incorporated independent institute for advanced study in the humanities. Since 1978, the center has awarded fellowships to more than 1,200 scholars, whose work has resulted in the publication of more than 1,400 books in all fields of humanistic study. The center also sponsors programs to strengthen the teaching of the humanities in secondary and higher education. For more information, go to http://nationalhumanitiescenter.org/.